"Tarma jewelry is my favorite! I think I first heard of your jewelry line while I was volunteering on an organic lettuce and coffee farm in Hawaii one winter. One of the other volunteers was wearing a Tarma necklace through all the hard farm work and I loved how simple and functional but pretty it looked on her. I’ve always been a tomboy of a girl who would rather be covered in dirt and camping or climbing mountains than dressing up and going shopping (or whatever it is “normal girls” do). But even with my love for flannel shirts and trucker hats to hide my greasy hair after days of camping, I still have a feminine side to me that likes to feel pretty. My Tarma necklaces are perfect for that; the charms represent things I love and the necklaces look pretty and clean somehow, even if you’ve been sweating away climbing a dusty mountain trail. It never gets in the way during wilderness adventures. I’ve worn my Tarma necklace through camping trips, climbing days, canyoneering, hiking, travel and long distance trail running; in fact, I hardly ever take it off! 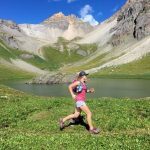 This year I completed several long distance trail running races, including my first 40 mile trail race over the mountains in Colorado. My Tarma necklace is like my little lucky charm that’s with me on all my adventures; it’s a little bit of happiness to carry around. My favorite designs are the ones that represent the outdoors and trail running. I wear the small rock cairn charm because I’ve always loved what cairns represent - messages from adventurers before you, helping you find the way. And I also wear the run charm with a heart on it because my favorite days are the ones spent trail running." Tarma Stories: Where Does Tarma Take You?